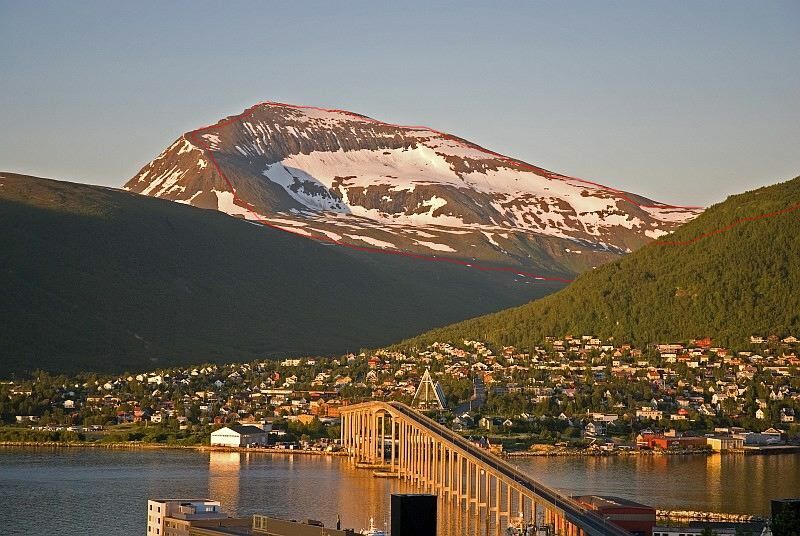 Hamperokken Skyrace has a technical course that links the summits of Tromsdalstind (1238 m) and Hamperokken (1404 meters). The race is part of the Migu Run Skyrunner® World Series, and has everything Skyrunning can offer with a mixture of technical terrain and trails, an impressive amount of vertical, and steep, technical descents. The aid stations will provide fruit, cookies and chocolate/candy. Cheese, sausage and other salty foods will be available at Breivikeidet. 8 hours to the aid station at Breivikeidet on the way back. Racers who do not make the first cut-off on Tromsdalstind will continue on the Tromsdalstind Skyrace course back to the finish. There will be transportation available from Breivikeidet to Tromsø for racers that do not make the cut-offs there. Expected finishing time is within 13 hours. Hamperokken: 1404m Gáranasčohkka, is the highest mountain peak on the mainland peninsula west of the Ullsfjorden. The mountain has an iconic long ridge culminated by a thin characteristic aiguille. Being on the center of Ullsfjorden, the views of Lyngen on the east and all the Tromsø mountains around gives us a big wilderness feeling. The race starts and finishes by the sea in Tromsø’s city center at Clarion Hotel The Edge. The first 3km follows the streets and over the bridge to the mainland. By the edge of the city, the first climb starts on a good trail that brings you up to the Fjellheisen (cable car) at 420 m.a.s.. Now above the tree line, terrain is mainly meadows patched with rocky areas. The next 8km are easy to run, very enjoyable, ups and downs (between 400 and 750hm) along smooth contour. You will pass the summit of Bønntuva, where the Bønntuva Skyrace turns around. In the next valley there is a small river crossing by the lake. This is the last place to fill water before arriving on the other side of Tromsdalstind. It is highly recommended to fill water bottles here! There will be path most of the time on this section, but be aware of the flags as the trails disappear in some areas. At the start of the final climb to the summit of Tromsdalstind, the trail becomes steeper and rockier, with some loose, uneven terrain. 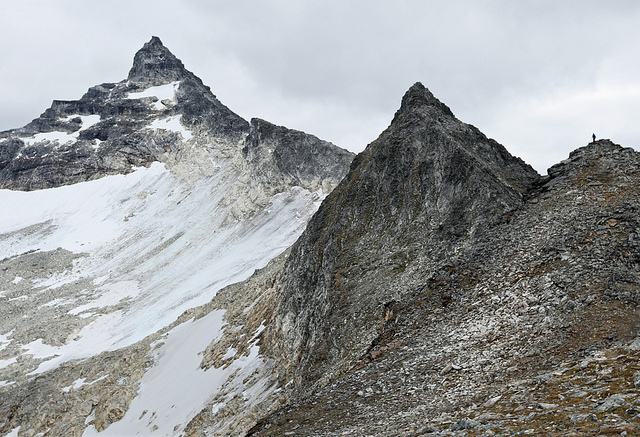 You will follow the ridge to the summit of Tromsdalstind (1238h m.a.s.). On a clear day you will have an amazing overview of the whole race from the summit of Tromsdalstinden, specially of the imposing Hamperokken (your next goal for the day) right to the southeast. The first part of the downhill from Tromsdalstind is steep and there are a lot of loose rocks and mud. This is one of the places where you should prioritize safety over speed. After the first 200-300 meters of vertical, the downhill becomes a pleasant, nice grade with friendly ground and some river crossings. At tree line the trail then descends steeply, and it can be muddy and slippery here. Down in the valley, the track is completely flat for a whole kilometer until the aid station by the road crossing. Once you have refilled, it’s time to start your way up to Hamperokken. You will cross a river before the ascent starts, and this is the last water before you come down from the summit. The trail up to the ridge is well used and easy to follow up, but keep in mind, there is a 1000 meter ascent here! The ridge starts from the summit of “Middagsaksla”. Hamperokken’s ridge can feel exposed in many places, but the rock is actually quite firm and the marked-trail will be wide enough for the runners to move safely. You will need to use your hands to scramble some areas, specially the last pitch before the summit (some fixed ropes will be set). By following the flags and keeping yourself aware, reaching the summit will not present any problems. If you have experience and feel comfortable in this kind of terrain, it will be an astonishing experience. The first part of the descent is down a steep slope with lots of loose stones in the top 200m. The terrain then turns into a large talus field that you will navigate along the lake and down to almost tree line. Just below tree line, you will join the same trail you ascended earlier and follow this to the aid station. After refueling, you will continue on across the valley and up to the summit of Tromdsalstind via the same route you descended earlier.